During the Abercrombie Black Friday 2019 sale, we expect sitewide savings on a wide selection of clothing items and apparel for men and women ranging from causal to elegant, yet retaining a very young feel and a rather modern attitude. The 2019 Abercrombie & Fitch Black Friday deals have not yet been released. While we don't have the Black Friday ad for Abercrombie.com yet, below are some of their historical deals which will give you a good indication of what you can expect during this year's sale. Abercrombie & Fitch's Black Friday deals are back and guess what? They are offering the same 50% off sale this year that they've offered the past few years! This is typically one of the more popular Black Friday sales with people lining up at the stores a couple of hours in advance so they can be the first to get the deals. 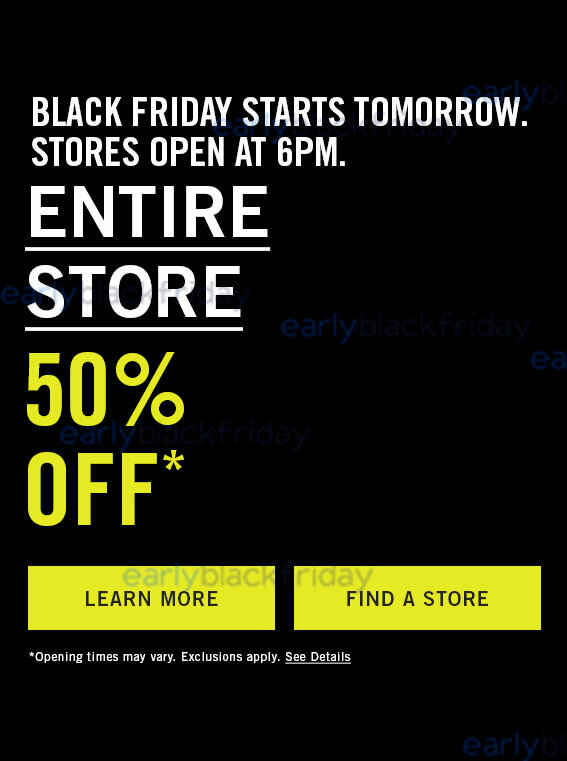 Remember, stores open at 6:00pm on Thanksgiving but if you don't feel like waiting, you can get the 50% off deals right now at the Abercrombie.com website (doesn't that sound much better?). 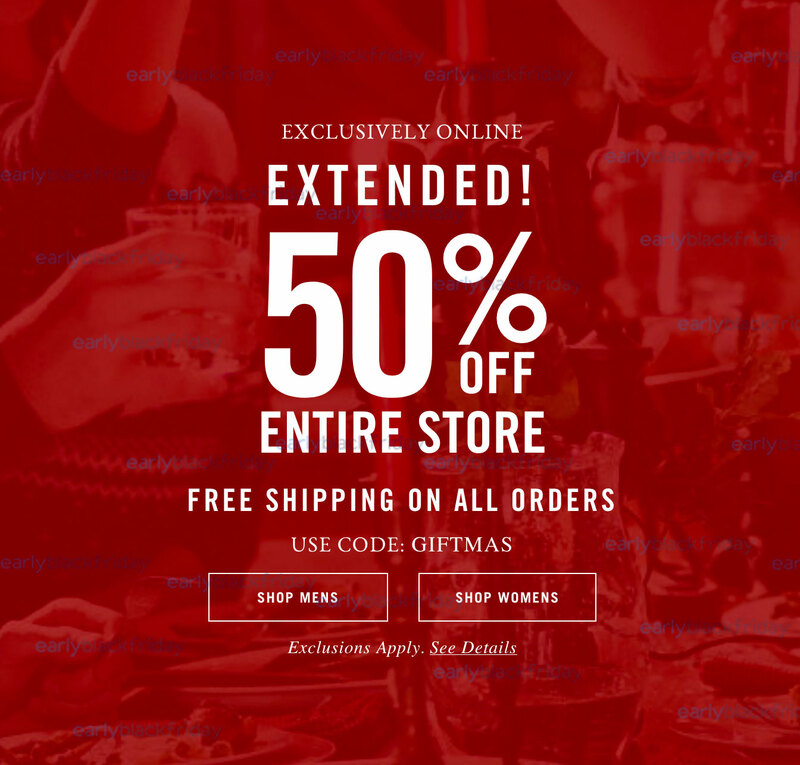 What they call the A&F Black Friday sale, Abercrombie is again having 50% off the entire store plus free shipping on all orders when you use code THANKS50 at checkout. 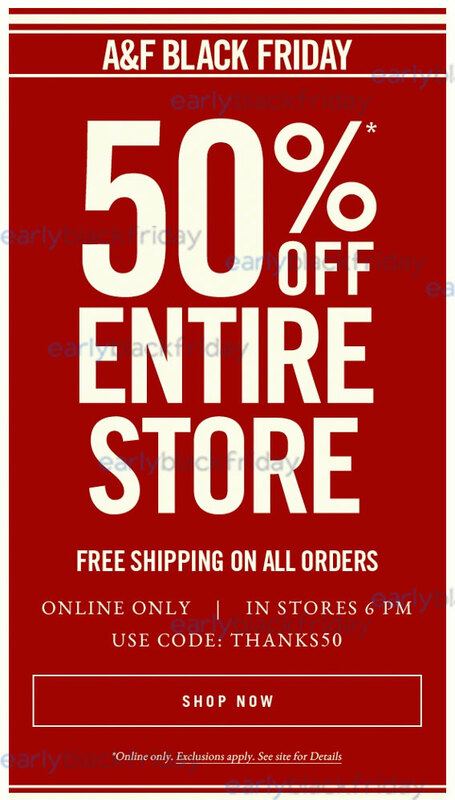 If you are going to the store, Abercrombie & Fitch will open at 6:00pm on Thanksgiving day but we really suggest that you take advantage of the deals right now at Abercrombie.com. Not only will this let you save a trip to the store, but you will also give yourself a couple of extra hours to process the giant turkey (and pie!) from earlier in the day. Exclusively online, the Abercrombie Black Friday sale has been extended an extra day! You can now get 40% off the entire store plus free shipping on all orders when you use code GIFTMAS at checkout. This discount applies to clothing and accessories for both men and women although some exclusions applies such as the Black Friday discount not extending to their clearance sale section. If you are going to visit an Abercrombie & Fitch store location in the mall, their holiday sale is only on Black Friday so we suggest that you get as many deals as possible in the store then go back home and shop online at Abercrombie.com to get those hard to find (or already sold out) sizes and styles.